indaHash needs our amazing community to come together for the indaHash Coin (IDH) – Huobi/Hadax Community Coin Vote! Huobi & Hadax are of the top 3 biggest exchange companies in the world. We believe that with your support we will be able to join one of the best places for trading! 2. Buy Huobi Token (HT) to be used to vote for indaHash Coin (IDH)! 3. 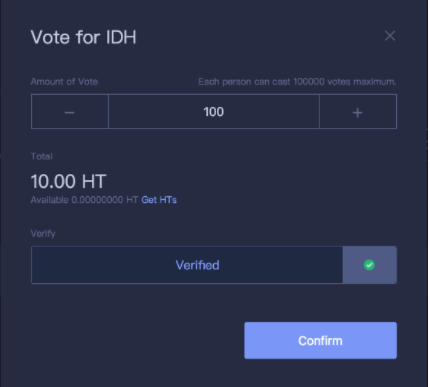 Vote for indaHash Coin (IDH) to be listed on HADAX at https://www.hadax.com/en-us/vote/ ! *IDH reward tokens will be distributed on Huobi Pro/Hadax and are waiting for you! That’s it! You’ve showed huge support for IDH! Thanks! The net value of the voting user’s balances is required to be 100 USDT or above. 1 vote costs 0.1 HT. Each user can cast more than 1 vote and cast for more than 1 time. Each user can cast up to 100,000 votes to one project. As you can see below, IDH is currently in first place! indaHash Reward Tokens are limited to 5 million IDH tokens, so around 1.67 million votes! Remember that 1 user can cast 100,000 votes maximum! Please spread the word to vote for IDH and let’s win this!